This 44" x 100' roll of Premium Luster Photo Inkjet Paper from Epson is a resin-coated medium with a 260 gsm and a 10 mil thickness which provide a durable photo feel. This instant drying paper produces vivid, lifelike images similar to traditional silver halide prints. Premium Luster Photo Paper delivers highly saturated prints with high ink absorption rates and a wide color gamut. 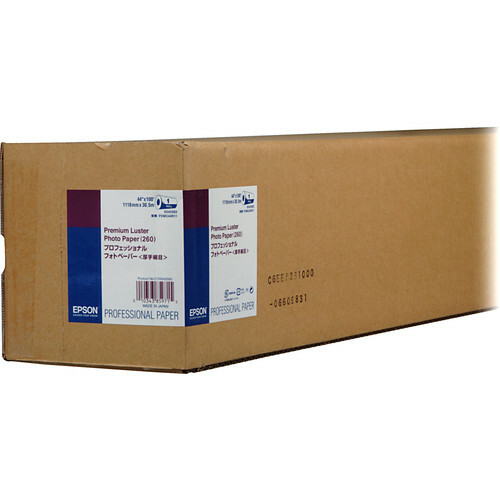 Premium Luster Photo Inkjet Paper (44" x 100' Roll) is rated 4.7 out of 5 by 36. Rated 2 out of 5 by Maxfidel from Epson Premium Luster Paper 44' Wide Roll I used the paper because I was trying Epson Paper for exhiition prints. This paper is very light-weight. It flexes easily and dimples are easily formed as you move it from printer to table. Tonight I made a B&W print and found the blacks not as deep and rich as more expensive papers I have previously used by other manufactors. I would only recommend using as a proofing paper, as if proofing of 44X64 is almost unreasonable. On the positive side I found the colors acceptable. So this is a good paper for me to learn how to operate my new Epson 9900, but I could never use in a museum show or sell a print to a collector. Rated 5 out of 5 by Spencer P from Best value and quality... I have used many papers over the years, many that cost much more than this. I use this paper for all of my exhibitions and gallery showings. It has worked perfect for when I shot digital, however now that I have switched to large format film, this paper shows all of the little details that the 8x10 film can achieve. I also like how this paper renders the blacks, they are rich and give a nice pop. I'm using this paper on an Epson 44" 9880 Pro. Be sure to download the ICC profiles from Epson to get the best print. Rated 5 out of 5 by Boston Pete from Gallery quality large format prints I have been printing and showing large format photos on this paper for about 3 years and have always been impressed by the results and archival characteristics. Many of my prints are 40x60.My only misgiving was that these were not traditional C-prints and that galleries would not want to handle pigment prints. But, on a recent trip to NYC I was really pleased to see how much large format gallery work was pigment. It makes sense and I am so glad to see this prediction is finally coming true! Rated 5 out of 5 by Anonymous from I would order this again!! I am an undergraduate student about to graduate in May. I have produced my first gallery show and I needed to print multiple large images. We have a 44 inch wide printer at our school and I saved a lot of money purchasing this paper, using what I needed, and sharing it with two other students! It shipped fast and was at my house in no time! The paper was packaged well and the paper was in perfect condition! Rated 5 out of 5 by pdr from premium luster paper i used the product to print archival quality photographs. its a fantastic paper - it has a bit more shine to it that i was expecting for a luster - but its still quite lovely. i think i might have been expecting more like an eggshell or a satin. but its more like a semi-gloss type of shine. it has a great thickness to it and i might even hang some of the work unframed. Rated 5 out of 5 by Marie thegoto from Excellent choice We use this paper in our Epson Stylus Pro 9890 (which is incredible by the way). Between this paper and this printer, can't go wrong. This paper gives us excellent detailed prints with longevity. We've had problems before with a different brand printer and their paper and our prints fading. Very happy with our Epson choices. Rated 5 out of 5 by Orchard Artist from Great paper I used the product in my 44 9880 printer. The color is excellent and the profiles are easily downloaded from Epson. The paper comes wrapped with a protective paper to hold it otgehter. It is not stuck with tape like other papers I I have purchased. Will this fit the Epson SureColor P9000? If you asking about the size - 44 inch - it will definitely work for P9000. If you are asking about the print quality then I can say that this paper works beautifully with the printer.